Android phone or Desktop PC to use bots. To download Telegram for PC, click here. Put @ before any bot's name to find them. If you're having a channel or group in Telegram, you can use @vote to conduct a poll. It's a bot to get the opinion from the members. The poll can be anonymous or public. In the anonymous poll, voter's name will not be displayed whereas, in public vote, you can find who voted favor and against the poll question. Alternatively, you can use @pollBot to make polls instantly. @like is similar to the vote bot. Your post will receive Likes or Dislikes from users. It is completely anonymous. You can use any other emojis instead of like and dislike symbols. By using this bot, your post will look nice. New users will find whether the published post has value or not. With the help of @Stickers, you can create stickers on Telegram. You've to follow certain criteria to create an awesome transparent sticker. The image file should have 512 x 512px for creating a sticker. Alternatively, you can use @EzStickerBot to make stickers. @ControllerBot allows you to create rich posts for your Telegram channel. You can schedule post and automatically destruct the post after a specific time. To set up and connect your channel to this bot successfully, you should follow the steps given in the bot. @mokubot is a multi-purpose Telegram bot where you can search Google, Wikipedia, dictionary at one place. Once you start the bot, you'll receive a list of commands to operate this bot. Give instructions according to the commands and gain knowledge. This bot is named as Otouto. @combot is a maintenance bot for your Telegram group. It can effectively manage analytics, moderation, reputation and much more. You have to add this bot your group and give necessary permission to activate the bot. @MissRose_bot is another powerful tool to manage your Telegram groups. It's the best spam filter bot to warn and clean the spammers. Controlling spam is a headache if you have a group. It's a must tool which let you feel relax. It will take care of maintaining the group all the time. @DeleteEventsBot can delete some of the events happened inside the Telegram group. Example: when someone joined your group, it will leave their identity. This bot can delete such event. Add this bot as admin with the right to delete messages. @pboxbot can save your notes, texts, media and other files as a vault. Since it works in inline mode, you can save the conversation from chats. Provide your name, password and save your files. Later, you can retrieve the files using a password. You can't restore the password if you forget it. @chatmodbot is specially developed for Blockchain enthusiast. This bot can help you to automate, track and grow your Telegram channel. You can also join your favorite Cryptographic projects using this bot. 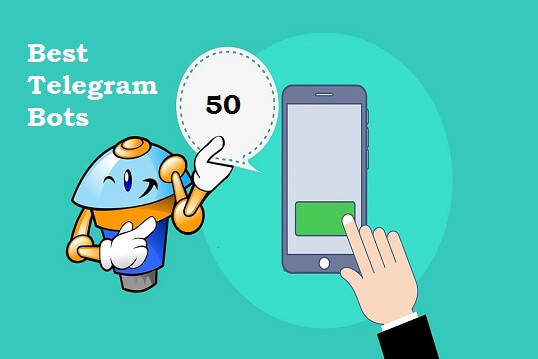 @GramToolBot is one of the best Telegram bots which can assist you to use Instagram effectively. You can download posts, account stats, research hashtags and finding most viral content on-the-go. You can add or remove Instagram username from tracking the status. @InviteMemberBot is the best bot for paid Telegram channels and groups. It can show subscription plans, send an invitation, remind and kick users out when the subscription ends. It can also accept payment from your subscribers. @dotobot allows you to create a to-do-list, share them with your teammates to do the job. It is very similar to the Trello app. Do you have any query in your mind? Ask @allqbot your questions. Your questions will be passed to other users who are all using this bot. They will answer your questions. In return, you can answer their questions. Do you have own own blog online? If you'd like to get Google Analytics metrics in Telegram, use @MetricsBot and connect. It is very useful when you use Telegram at work. Looking for a temporary email address? You should use @DropmailBot to generate random email address which can be disposable. You'll receive incoming mail in this bot which includes the From address, subject, and body of the email. If you don't use this email address, it will be destructed automatically. You can reactivate the email address any time. You can also create multiple self-destructive email addresses. With @swell_bot you can contribute your vote for cool stuff which can help other users to make a correct decision. You'll be given a question with an awesome image and answers. Give your opinion and move on to the next question. @IFTTT is the world-class Telegram bot to link your channels or groups with more than 360 online services like Instagram, Facebook, Twitter, etc and so on. You've to set this bot as admin and follow the instructions to link the services. It can import data from other services and sync with your group or channel. @NowTredingBot helps you to find trending or viral content on Google, YouTube, Vimeo, and Twitter. Once you start the bot, you have to choose the country to view the trending content. Then choose the category to find the specific type of content. @GroupButler_bot is an effective anti-flood bot for your Telegram channel. You can set rules, ban users and send custom messages like a Pro administrator. Try this bot by making it as Admin. @Snipfeed_News_bot helps you to find Trending stories, news, quizzes and much more. It's the best bot in providing personalized content at your fingertip. Are you an anime lover? Well, use @tan_images_bot can send you random anime pics, latest and popular anime images and much more. Just start the bot and tap the options to receive unlimited anime pics. @InstantRemindersBot is a wonderful tool which can remind you about everything. Initially, it requires your timezone. You don't need to Turn on the GPS on your phone. Instead, you've to give the location manually. This bot will accept text messages and media files for reminding them. Set a reminder by time and relax. If you're looking for an instant translation bot, you should use @YTranslateBot. It can translate between 12 popular languages which include English, Deutsch, Italiano, Arabic, etc and so on. @openmap_bot is a navigational guidance bot which can send you maps from OpenStreetMap and satellite images. The beauty of this bot is that it works in inline mode. Send the place name, you'll receive the map with accurate pinpointed location. Also, you can browse the map internally. @CommentsUserBot helps you to add comments box for your every new post on Telegram channel. Therefore, users can send feedback about your post in the comments. Add this bot as admin and give 'add & edit' post permissions. @LexicoBot is a decent multifunctional dictionary bot. By sending commands and query, it can execute the definition, meaning, and antonyms of the input words. If this bot doesn't reveal certain definitions, contact the support team and inform them to fix the issues. Do you like to play Quiz? You should try @PandaQuizEnBot. This bot has more than 2000 questions to inspire you. For each question, you've to choose from multiple choice answers. You can ask for a clue to find the answer. If you can't find the answer, ask the bot by hitting the SOS button. @BlitzyBot is a location-based messaging chatbot. You can interact with mobile users via text and multi-media messages. You can sell or buy things with nearby people using this bot. Start the bot > Enter your location and update your profile. @KweriBot is another but a simple quiz bot to play around. For every question, your answer should be Yes or No. i.e., Y (or) N. You'll receive loads of new questions one by one. If you failed to give a correct answer, you need to start from the beginning. Do you want to learn about your and others personality, then you should use @RorschachTestBot. It will ask you to choose a card from a picture. Then you've to tell what you notice from the picture. Finally, it will analyze your thoughts and tell your personality type. Some people love to send slang in the text message. It will save their time by sending quick slangs instead of typing full text. @MessageWizBot helps you to teach trill text slang for any sentence you write. You can communicate faster with anyone using this bot. Are you ready to play games in Telegram? @chtwrsbot allows you to join with multiple players chat to play the Castle game. Choose the warrior and start to play the virtual game. @ErwinChatBot will asks you interesting General Knowledge questions without multiple choice answers. You've to think and write the correct answer. You can ask for the clue or hint to solve the question. Chess is the best game to improve brain activity. Train your brain quickly by playing chess puzzles. Use @chessexercisesbot and find the best moves. @metagon_bot is a multi-purpose Telegram bot to find anime/animal pics from Flickr, DeviantArt, Imgur. In addition, you can check out Minecraft tools, 9gag, Yelp and much more. @gamee is the best place to play social games. Here, you have to pick a game and challenge your friends. You can play random or trending games to get in touch with your friends. Wait! @chat_against_humanity_bot is not about spreading hate speech. It's just a card game to play with your friends. You'll get a private message each time to pick the best answer card from the list of cards. @ArenaGameTelegramBot is a nice game to fight in single or team against other players. There is a basic skills section to learn this game. Invite your friends to the game and you'll receive a reward for each player as a bonus. @xoBot is a simple bingo game to play with another player or bot. You can set a difficulty in this game to test your skills. You can also check your stats in this bot. @gamebot helps you to find a few fun-filled games to play. First, you have to choose a friend and then select a game to play. @Spotybot allows you to find your favorite song. It will send you the link via inline message where you can download the song with one-click. @MP3sBot works inline mode which allows you to listen and download your favorite music. You can find songs in various languages. It works similar to Spotybot. @vkmusic_bot is the best music downloader bot. It doesn't use inline mode. You need to type the song name or artist name using specific commands. The bot will search and tell you all available versions of the song. Choose the version as per your choice. Immediately, you'll receive the music file to listen and download. Love to sing along with a song using lyrics? Try @LyricZbot. Enter the song name/artist name/piece of the song to find the lyrics. You'll get links to see the whole lyrics. Then you can enjoy singing! @twiMonBot will notify you when your favorite streamers on Twitch and YouTube comes Live-Stream broadcast. Enter the channel URL or name to get notified. @watchcomicbot helps you to find anime shows, Tv shows, movies and much more. Since this bot works in inline, you've to give commands to find movies. Tap 'Watch Now' button. Then you'll be redirected to a website to watch the movie online. @VlipBot helps you to find short expressive video clips to share with your friends. Open any chat, type the command and search term. It will list results to share within the chat. As the name implies @BotFather is the father of all bots. It is the one place to create and manage your bots. You can also manage your existing bots using this bot. It is one of the best Telegram bots I've used. If you know python, you can easily create a custom bot using bot father. Curious to know the current weather condition in your city? @weatherbot is the best tool you should use daily. Like a news reporter, it will tell the accurate weather condition. Set your location and get the instant weather report. Many developers have built useful Telegram bots. If you know Python and Java, you can create your own Telegram bot. With the help of Telegram bot API, you can send commands to your bot. Liked the Telegram bot list? Please share and subscribe!